Today was a long day. Just one of those crazy busy days that seems to last forever and wears you out. The morning started out like any other. I got my Preschooler up and ready for school. 8:00am my two little ones and I were out the door to start our day. I dropped “G” off at school and then headed to the post office. After the post office, my little “RJ” and I headed to Wal-Mart for some grocery shopping. And this is where my day starts to feel long…My goal today was to stock up on things we need for the next two days before we head out to see family for Thanksgiving and, to get some snacks and such for our trip. While on our way home from the store, I realized I forgot two things on my list; two things I REALLY needed. *Sigh* I knew I’d have to make yet another trip to Wal-Mart today. Upon arriving home, I put the little one down for his morning nap and then proceeded to put the groceries away, cleared the dishwasher, took a quick shower, got “RJ”, and left to pick up “G” from school. Then, it was off to Wal-Mart…again. I only needed two items, but when you’re in the store with a 4-year-old and a 1-year-old, it always takes longer than you think it will. As I’m headed to the check out, my 4-year-old announces, “Mommy, I need to go to the bathroom.” Of course. So, off we go. After finally checking out, we get to head home. After lunch it was off to the doctor for an appointment for the little one. My boys were extremely rambunctious for some reason as we sat in the waiting room. Well, I should say, I sat and watched them as they ran around the room. Don’t worry, there wasn’t anyone else in there. After the nurse takes us back to our room and we wait for the doctor, the boys are into everything. Climbing onto the table, tipping the stool over, throwing the books and magazines on the floor, climbing on the chairs. They were in rare form today. I spent our time waiting for the doctor wrangling them and trying to keep them from getting hurt. We finally see the doctor and, as I feared might happen, the doctor told me “RJ” needed a prescription. So, after the appointment, I was off to Wal-Mart yet again. Three trips in one day. Definitely not how I had planned. 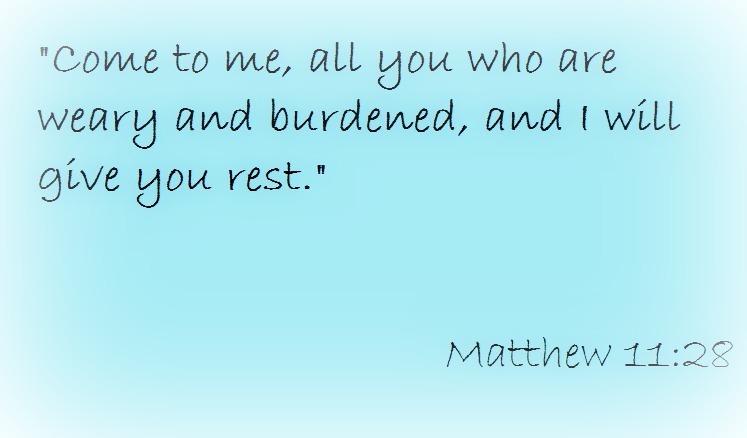 Today, I clung to the scripture verse Matthew 11:28. “Come to me, all you who are weary and burdened, and I will give you rest.” God is the one who gives me rest and restores my body, mind and soul after days like today. He takes care of me after I spend my day(s) taking care of my family. He gives me the rest I need.